In 1975 the band Simba was founded including Neil Guevara (leader & guitar) and his wife Dee Anderson (vocals), Hassan Omari (vocals, percussion), Ben Hill (drums), Michael Benjamin (keyboard & vocals), Tony Paul (congas, percussion, vocals), and Mike Rivard (bass). Peter Nelson (grandfather of Jamal "Shango" James) and Tony Paul would go on to start Shangoya including Lloyd Corner, Wayne McFarland, Sherman Valman, Cheryl Davison, Chico Fat fingers, and Lance Pollane. In May of '76, local band manager and promoter TJ Western brought The Wailers to a gig where Simba was performing at the 10th anniversary of the Walker Art Center and they joined Simba on stage to jam! The Wailers stayed in town for a week and he took them to a Kicks soccer game and to a private party at a north Minneapolis apartment where no one knew who they were and they had a good time. But booking mangers at the Cabooze called Simba a "pimp music" band because the members were black. When trying to book the band in North Minneapolis they called it "white boy" music. So the level of racism and ignorance was acute. He produced the television program "Reggae Music" (below) in an attempt to expose people to the music. They used to get a lot bookings in the outlying areas like Albert Lee, private parties in Veteran's halls, and sold-out river cruises. And then, boom. Women of Reggae started in '79, '86 saw Shalita and McGee start Shalita Band, and Wayne leave Shangoya to start Ipso Facto. Then in '87 Mick Labrola left Macomba, hooked up with Neil Guevara and Lance Polane and started The Maroons. In '89 McGee hooked up with two new comers from Africa, the brilliant Innocent and Onesmo, and started Exodus. In '90 Genral Nicoleson started Roots Experience with Victor, Jah B, Jerimi, Stevo, Jeff, and Techa Youth. 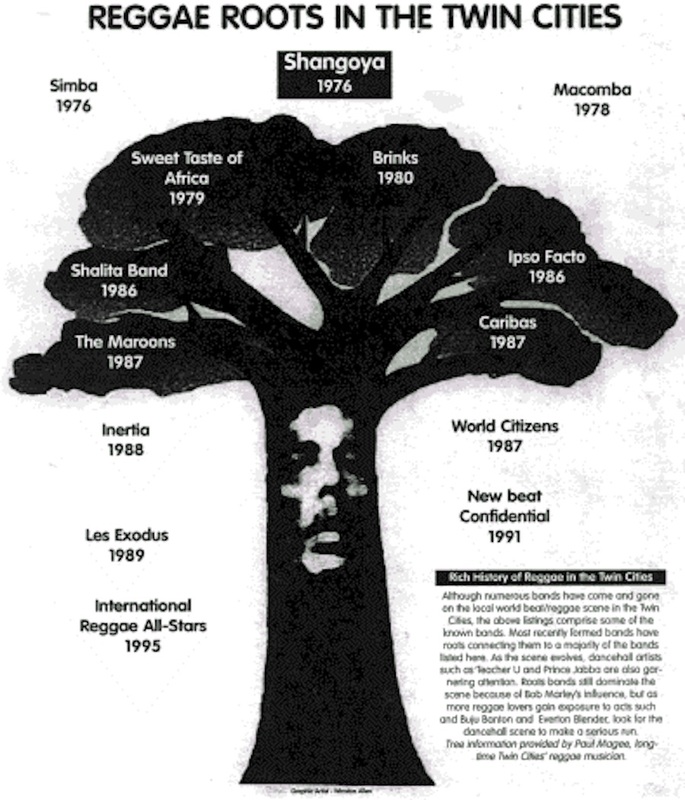 In '92 Lynval Jackson started International Reggae All-Stars. In 2000 Pee Wee Dread and Rali started Dread I Dread. In '02 McGee created one of the hottest bands in the Twin Cities in Island Soul, also releasing their eponymous debut album. And in '04 Will Tucker from Belize started I-Roots Reggae, still one of the best playing Reggae and Soca.